It’s the end of November and in my family that means its time to make the Christmas pudding! This activity takes two whole days, and it’s well worth it! This tradition started almost ten years ago when I came across a wonderful recipe from Stephanie Alexander. She uses a mix of dried fruit and as a result, no sugar needs to be added. My dad and I are the chief pudding makers. We mix the fruit in a large ceramic bowl and give it a good “drink” of tawny port . The bowl is covered and left to sit overnight at room temperature to soak up the flavour. It needs a stir every so often. 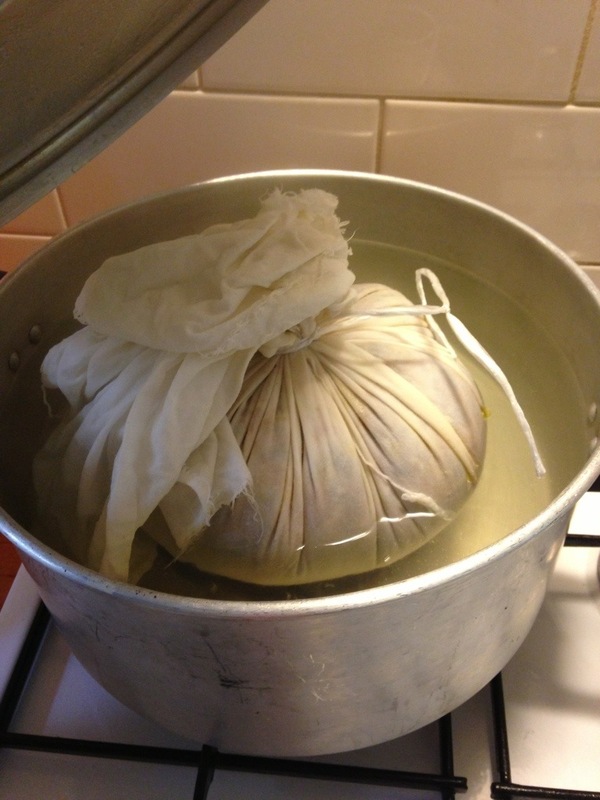 The next day we boil the pudding cloth (a piece of calico 60x60cm) that has been soaked in cold water overnight. We taste the fruit mixture to make sure it’s delicious, then add in the spices, flour, butter and egg. We taste it again just to make sure it’s perfect. It always is and as a result, the end pudding is always slightly smaller than it should be! A big pot of boiling water sits on the stove and we throw the cloth in for one minute. I don thick rubber gloves, retrieve the cloth, wring it out and spread it over the clean kitchen bench. Dad sprinkles a good handful of flour onto the cloth and I spread it out. Then Dad holds the bowl and I spoon the mixture into the middle of the cloth. It’s now time to bring it all together, literally! I gather the corners of the cloth at the top of the mixture and Dad skillfully cuts a long length of string which he then winds around the top, tying it firmly and as close to the mixture as possible. And now it’s time to boil the pudding… For six hours! We keep watch making sure the water is topped up almost the the brim. Cups of tea and a few biccies are consumed in the process! Yes, making Christmas pudding reminds me of what is so lovely about this time of year: spending time with those we love and making traditions of our own! Instead we went to the pub and she ate a parma while I drank the pot. 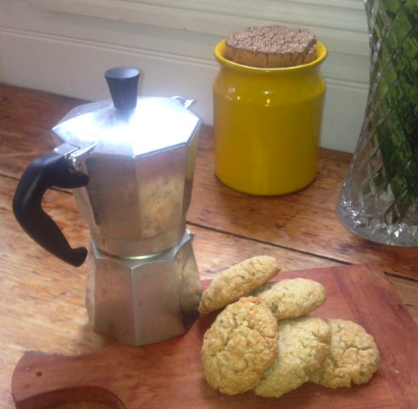 When we got home we baked ANZAC biscuits. We talked about the ANZAC, international relations and respecting cultural values. As I bit my biccie, I realised we were in the midst of experiencing a good Aussie rural tradition: a cup of tea and an ANZAC biscuit. It made me think that if more people shared more tea and more biccies, international relations everywhere would be respected and as a result improve. And if ANZAC biccies added six inches to my height, everyone would be a winner.